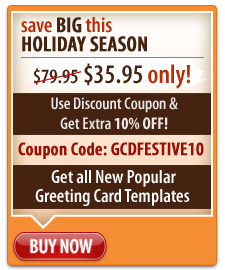 Greeting Card Studio Greeting Card Templates–The Ultimate Way to Create Attractive Greeting Cards! Greeting cards are the perfect way to convey your thoughts and affections to your near and dear ones. Designing a card yourself shows that you care about the person you are giving the card to. Designing cards can be easy with Greeting Card Studio card creation software. Using the templates provided in this software, you can design beautiful greeting cards for all purposes within minutes. Card templates offered to you in Greeting Card Studio help to create wonderful cards on your own for the people close to you. With the advanced templates in this software, you can customize your greeting cards and beautify them. You will get the below-mentioned benefits of creating greeting cards with Greeting Card Studio greeting card maker. You can choose from an array of card templates for various occasions. You can create amazing designs from over 300 professionally designed card templates. Insert an image of yours to give a personalized touch to your greeting card. You can add appealing symbols, shapes, borders and backgrounds to your card design and brighten it with the use of Greeting Card Studio. You can do editing to the greeting card templates and add a personalized message or text to your card. You can use the card editing tools to edit, crop, flip or rotate your card design the way you like. You can add the color of your choice to your greeting card or adjust the existing colors too. You can generate your card in formats like PDF, JPG, GIF, BMP, PNG, and TIFF. The importance of using Greeting Card Studio greeting card templates is that you get a customized and highly personalized card, and you don't have to work from scratch to create it. The beautifully designed templates offer you all the features that are required to generate an excellent card for various purposes. You can pick any card template according to the occasion and customize it the way you desire. This card creation software is a cost-effective and the most creative way to design a card for your loved ones. The good thing about using this software is that you can print your card from home computer so you do not have to spend anything for that too. You can also save your card for later use or email it. The same card can be edited and used for another purpose using Greeting Card Studio. So, you do not have to go elsewhere to get your card designed as you can easily do that on your own using our software.